Our friends at Minnehaha Wolf Patrol (MinnehahaWolfPatrol@gmail.com) are working hard to stop a new wolf fur farm in South Dakota. Please support and share! 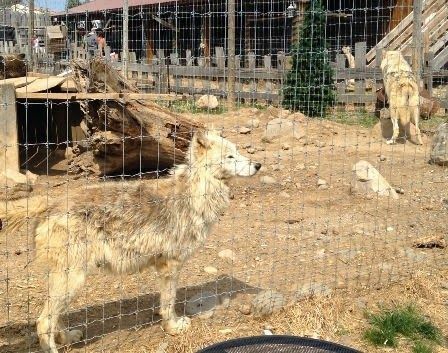 Fur-Ever Wild, a wolf fur farm owned by Terri Petter located in Lakeville, Minnesota is attempting to open a petting zoo in Deadwood, South Dakota but has met opposition due to concerns over mistreatment of animals and the belief her zoo is nothing but a front for her fur farm. According to a deposition unrelated to the opening of the petting zoo, Petter has admitted to breeding captive wolves in addition to other animals and killing them for their fur. The deposition is available to the public and excerpts have been posted online here. Terri Petter is currently facing a lawsuit filed by her neighbors in Eureka Township over safety and health concerns. Congratulations to Joshua Horwitz, author of War of the Whales: A True Story – winner of the 2015 PEN Literary Award for Science Writing (PEN/E.O. Wilson Literary Science Writing Award). His selection, announced today, confirms the consensus of so many readers and critics that War of the Whales is an exceptional achievement in non-fiction story-telling. This prestigious prize is the latest critical acclaim that War of the Whales has received – and it is certain to widen still further the audience that the book has already achieved. Please share the video and help find a forever home for Thor. Please visit Eldad Hagar’s web site, Hope for Paws and if possible, make a donation to support his life saving work. Many of you have probably signed petitions or campaigned against the slaughter of the seals this year. Sadly, this gruesome “tradition” of murdering the youngest seals for their beautiful coats is still being done. “This year’s hunt started slowly, with only one quarter as many boats as last year setting out for the ice floes. Unfortunately, within a few days the hunt began, and we began recording. Although 27,000 seals have been killed so far this year, 42,000 were killed in the same time frame last year — and 77,000 in as many days in 2013. The sealers know that the images we document are shutting their industry down. Often, they simply stop hunting when they see us — our presence saves lives.